Successfully Added Vnetphone V1-A2 Bluetooth Headset - Bluetooth v4.0, 10Meter Range, Weatherproof, 260mAh Battery to your Shopping Cart. 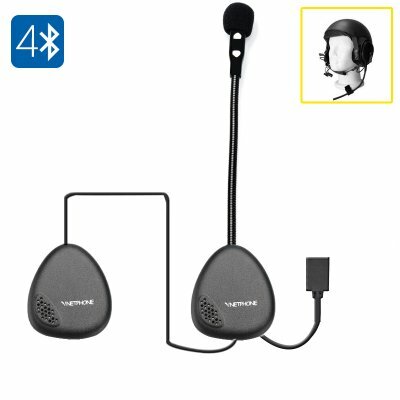 Vnetphone V1-A2 Bluetooth 4.0 Headset for sports and motorbikes has 10 meter range and built in 260mnAh battery for a long usage time. Motorcycle speakers have come a long way in since the early days and now you really can get some great value for the money. Vnetphone is one of the high quality brands that are making a name for themselves with these motorcycle accessories but they can be used for a whole lot more as well. The Vnetphone V1-2A model uses Bluetooth 4.0 that bring a stable connection but also allows the device to be incredibly power efficient so with a built in 260mAh battery you get an incredible 8 hours of talk time or around 150 hours in standby. The 10 meter connection range lets you pair it with a phone in your pocket or panniers and it can even be sued when cycling, skiing or for many other outdoor sports as its very weather resistant. Sync it to a music player, GPS or your cell phone and enjoy the pleasures of hands free communication as you swish down the slopes or tear it up on the roads. The choice is yours and Vnetphone brings you the freedom to enjoy it. Vnetphone V1-A2 Bluetooth Headset - Bluetooth v4.0, 10Meter Range, Weatherproof, 260mAh Battery - [CVUV-E463].